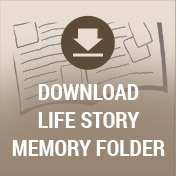 Life in early Austria was wrought with conflict and political unrest. Among the cascading Alps and rolling hills, the introduction of the Alpine dollar found the country experiencing a brief economic high, especially from 1924 until the near monetary crash known as Black Tuesday. Yet it was during this time of prosperity on April 19, 1926 when the lives of Franz and Franziska (Brandmeier) Vorberger were forever changed with the birth of their precious little girl, Pauline. Born and raised in the small Austrian village of Kreith, Pauline was the oldest of the three Voreberger children. She was later joined by two younger brothers, Franz and Hubert. 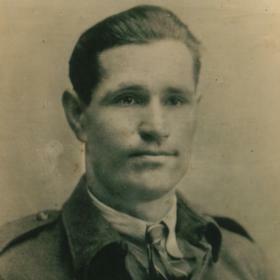 Pauline’s father managed their large family dairy farm which also included wheat and other crops while Pauline’s mother’s family owned and operated the farm. Her mother was a busy homemaker and also did her part to help out. Life for young Pauline was an adventure growing up on the farm. Everyone pitched in to do their part, and from a young age Pauline learned the value of hard work and the love of family. The large extended Voraberger family all lived on the farm. Side-by-side, they worked hard and celebrated life’s greatest joys and deepest sorrows together. Pauline was raised and confirmed in the Catholic faith, and they attended Mass regularly. She received her early education from the public school located several miles from their farm which often proved to be a struggle during the harsh winters and deep snow. As was typical at the time, Pauline went to school until she was 14 years old. World War II was in full force during Pauline’s formative years and Austria was under heavy German rule. The German’s formed a prisoner of war camp in Pauline’s little town and Serbian prisoners were often brought to their farm to work. One of those prisoners, Marko Banjac swept Pauline off her feet. Deeply in love from the moment they laid eyes on one another, a romance developed and Pauline soon found herself pregnant. In 1944, she gave birth to their daughter, Frances “Fani”. Pauline and Marko’s relationship was absolutely forbidden according to German rule. And although they were able to keep it hidden from the authorities for a time, the Nazi’s eventually discovered their secret and assassinated Pauline’s beloved Marko. Pauline raised Fani with the help of her family until the war came to a thankful end. As fate would have it, it was then when Pauline met Steve Miletich, a friend and fellow prisoner with Marko. 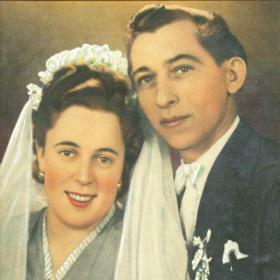 The two fell in love and were happily married in 1947. Two years later in 1949, they welcomed the birth of their daughter, Emilie “Amy” who added much to their family. As a trained tailor, it was in 1950 when Pauline and Steve made their way to the U.S. They were sponsored by the First Congregation Church in Muskegon, Michigan where they settled and made their home. Speaking barely any English, they made do and although it wasn’t easy, they became accustomed to the American way of life. The family lived on Amity Avenue for a time before moving into their family home at 1712 Pine Street. Their son, Steve joined Fani and Amy when he came along in 1956, and daughter, Tammie completed their family in 1964. They faithfully attended First Congregational Church, although Pauline always kept her Catholic roots and faith close to her heart. She even continued to abstain the Catholic tradition of no meat on Fridays throughout her life. Her husband ran a successful tailor shop in Muskegon where he was well received for his quality workmanship. Pauline made a good home for Steve and the kids along with helping him at the Tailor Shop on Larch Avenue where she helped with some of the accounting and other chores. Pauline was an excellent cook and no one ever left her home hungry. She made the best Wienerschnitzel and other authentic Austrian dishes, and she loved her coffee, Tasters Choice instant. She enjoyed drinking it in a fancy cup and saucer, and she particularly liked pouring it over her honey-nut Cheerios for breakfast!. When entertaining guests and visitors, she brewed regular coffee. When it came to her children, Pauline was a wonderful mother. She was caring, thoughtful, compassionate, and loving. With unconditional love, she offered her children encouragement and support in each of their life decisions, yet she never pried. Quite a social couple with a large group of friends, Pauline and Steve were active members of the German Club. 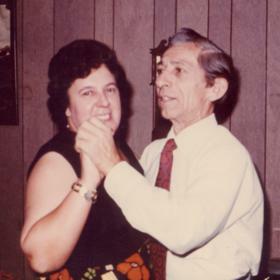 Pauline loved listening to German music and occasionally allowed Steve to even drag her out onto the dance floor. At home on Saturday nights, she rarely missed Lawrence Welk on TV. In 1976, Pauline’s husband, Steve passed away following a short battle with lung cancer. His death was no less difficult for Pauline, especially having to raise their youngest daughter, Tammie on her own. Pauline made do, living on Social Security while supplementing that income with babysitting jobs. Pauline wasn’t meant to be alone. She eventually began dating Joe Wiszynski, an old family friend. A single father with three grown children, Joe made a living managing several rental properties he owned. Pauline and Joe made for the best companions. In 1981 they married, settling into a home on Division Street where Pauline enjoyed a big garden and helped Joe with his beautiful rose bushes. These were good years for Pauline. When Joe died in 1994, Pauline eventually moved into Barclay Senior Village where she would live for many years. Family was always at the center of Pauline’s heart. She especially loved becoming a grandmother. 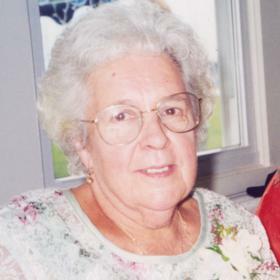 Her grandchildren referred to her as, “Oma”, and throughout the years she loved nothing more than babysitting and spending time with her grandchildren and great-grandchildren at every opportunity. They relished numerous sleepovers at their Oma’s house and annual trips to Frankenmuth, Michigan to visit Bronner’s and eat Wienerschnitzel while listening to German tunes. Pauline also took several trips over the years to her homeland of Austria to visit her parents, brothers and other relatives and was accompanied several of those times by her daughter, Fani. Time found Pauline slowing down some yet even as she aged, Pauline faithfully attended church and enjoyed going to bingo every now and then. When her health began to decline and signs of Alzheimer’s disease became evident, Pauline’s daughter, Amy stepped in and took great care of her. For several years Amy paid Pauline’s bills, managed her medicine and took her to her doctor’s appointments. Sadly, Amy suffered from her own health issues. Diagnosed with cancer, she could no longer take care of Pauline and in 2015 she passed away. Pauline then went to live with her son, Steve and his wife Reyne in Ludington where she spent the last two years of her life. 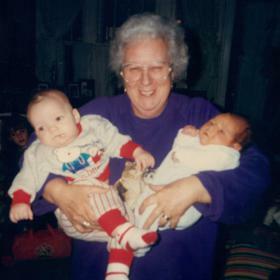 Her memory slowly faded during these years but she never ceased in being the same loving Oma to the family she loved and adored. Throughout her life, Pauline held fast to her faith. It saw her through the worst of times, and she was exceedingly thankful for the happy times life brought her way. A loving and devoted wife, mother, grandmother, great-grandmother, and wonderful friend, Pauline’s love for her family and friends shone bright in all she said and did. Mrs. Pauline Miletich-Wiszynski, age 91, passed away Wednesday, June 28, 2017. Entering into the final stages of her illness, she spent the final two years with her devoted son, Steve and daughter-in-law, Reyne. SURVIVORS: Son, Steve (Reyne) Miletich Jr. of Ludington; daughters, Tammie (Jerry) Beegle of Montague, Frances (Jerry) McCrea-Markle of CA; stepchildren, George (Carol) Wiszynski, Olga (Larry) Workman, Theresa (Ed) Haas; 11 grandchildren; 19 great-grandchildren; three great great-grandchildren; brother, Hubert Voraberger of Austria. She was preceded in death by her daughter, Emilie (Amy) Miletich, both husbands, two grandchildren and by her brother, Franz Voraberger. SERVICE: Saturday, July 1, 2017, 11:00 am with visitation one hour prior to the service at the Clock Chapel - Muskegon with Dale Clock officiating. Interment in Evergreen Cemetery. MEMORIAL: Alzheimer's Association.